Straightforward Shooting offers individualized, fun, and safe firearms training and pepper spray instruction. Our firearms training classes are comprehensive and unique. We guarantee personalized instruction addressed to you and your needs. Whether you are a beginner or an advanced student, our experienced, NRA Certified instructors can improve your skills. Our popular concealed handgun classes have qualified over 3,500 Coloradans to apply for their concealed carry permits and taught hundreds how to shoot rifle and shotgun. We also pride ourselves in working with kids–they love our rifle and shotgun courses. Whether you are working on the basics of target shooting or advanced self-defense for your family in your house, our NRA and SABRE Certified Instructors will send you home confident of your new knowledge and skills. Qualify to apply for you concealed handgun classes. Learn basic or advanced rifle skills. Acquire basic or advanced shotgun skills. Learn how to carry a concealed handgun in public with confidence in our Holster 101 class. Learn how to defend yourself and your family in your own home. 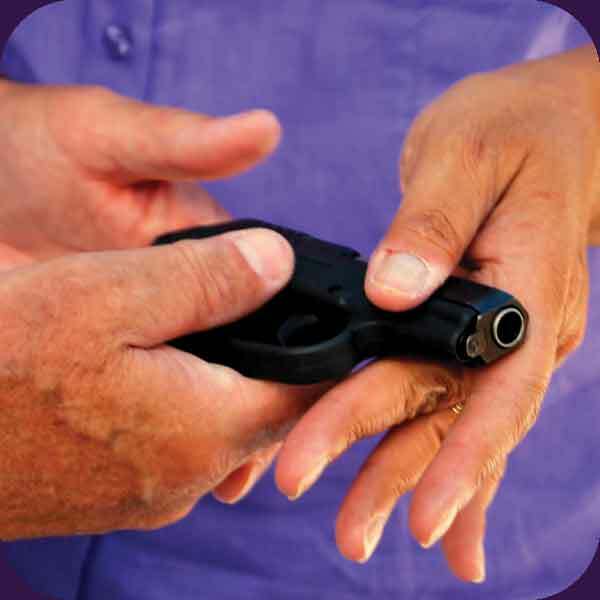 Get hands-on firearms training with pepper spray for self-defense. Experience the most comprehensive firearms training program in Colorado. If you just want to try shooting a pistol or a rifle, we won’t push you into advanced techniques. If you have made a decision to defend yourself and your family, we will walk you through the advanced steps to do that with confidence. Our focus is on what you want to accomplish in your firearms training and to assist you in increasing your proficiency.